Fairbanks, Alaska (AK) – Explore Fairbanks announces the launch of its new responsive website www.explorefairbanks.com at 5p.m. on December 15, 2016. The website includes Fairbanks, North Pole, Denali, and Alaska’s Interior and Arctic. 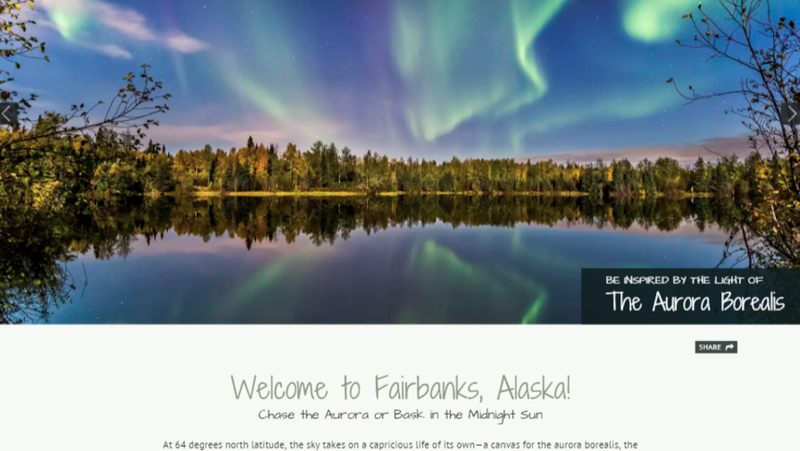 The aurora borealis and midnight sun, natural wonders that are fundamental to Fairbanks and the region, are predominately featured throughout the new site. The contemporary site is responsive across all platforms and devices including mobile, tablet and desktop. Explore the Area, on the navigation bar, is a comprehensive category that highlights the many distinctive characteristics of the region including: Seasonal Explorations, Local Destinations, Sports and Outdoor Recreation, as well as Travel and Insider Tips. The site is designed to give potential visitors a portal into life in the far north and encourage year-round visitation. More than 400 tourism and related businesses are listed in the following categories: Things to Do, Places to Stay, Restaurants and Shopping, and Planning Tools. Searchable business partner listings are embellished with photography, videos and a local map. Also available is a new link for booking lodging, activities and tours. Explore Fairbanks partnered with the interactive agency Simpleview to build the site in close coordination with Explore Fairbanks staff and local stakeholders.